It was a tumultuous year for the auto industry and for American car enthusiasts. We watched new cars rise, old companies fall, and heroes pass. These are the ten car stories that Jalopnik readers thought defined the automotive world in 2011. 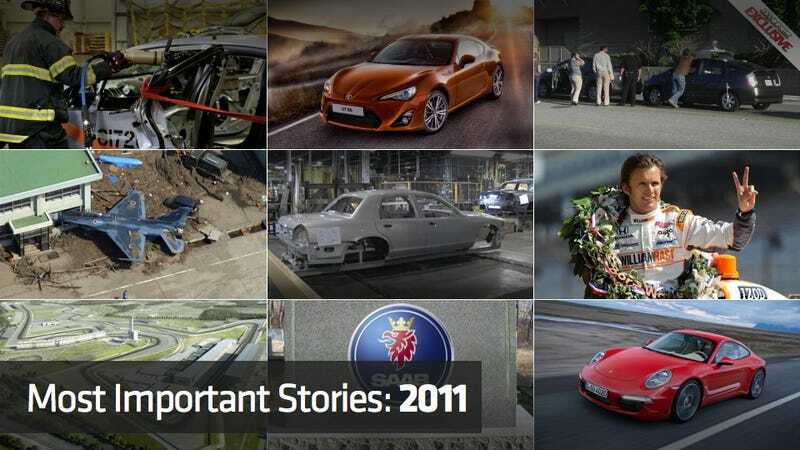 What was the most important car story of 2011? Why it's important: The evergreen sports car entered into a new generation of excellence in 2011, with a bigger, plusher, and yet somehow more rewarding form. Everyone from weekend racers to Beverly Hills poseurs has something to look forward to in this new car. Why it's important: With the US debut of the stunning documentary of his life and death, Senna, America and the world reignited their passion for the spirited, spiritual racer from Brazil. Why it's important: Toyota and Subaru delivered the shining light for automotive enthusiasts this year, the Toyota FT86/Scion FR-S/Subaru BRZ triplets, though we won't get the Toyota here in America. We're happy that Toyota is trying to get its groove back, but we're shocked that there is a new, affordable car that we can't wait to drive and want desperately to own. Why it's important: Bernie Ecclestone approves two new American grands prix: one in Austin, Texas, and one in New Jersey, just across the Hudson River from New York City. We might only be setting ourselves up for complete disappointment when the cities back out of the money pit that is Formula One in a few years, but for now we're just happy we don't have to drive up to America's hat to see F1. David Coulthard talks donuts, breakfast tacos, and F1 in the U.S.
Why it's important: The last representative of what was once America's automotive standard, the body-on-frame full-size sedan, ended its astounding 32-year production run. The Crown Vic was the country's last great body-on-frame rear-drive V8-powered sedan. No tall-boy crossover or SUV can truly take its place of a simple, durable, great vehicle. Why it's important: Saab was finally committed to the earth after it filed for bankruptcy with no buyers, and then GM sealed its fate by blocking any hopes of a sale to the Chinese due to concerns over the transfer of technology. A celebrated marquee finally succumbed to a decades-long disease of platform prostitution in the harsh modern international car market. Why it's important: The safety of electric vehicles was called into question when a crashed Volt caught fire in storage. Jalopnik and many others concluded that electric cars are indeed safe, but the electrification of the automobile took a significant blow with this PR nightmare for plug-in hybrids and pure battery electric vehicles. See: Chevy Volt crash test fire exploded into federal investigation; Are electric cars safe? Why it's important: The world took its first hard look at what the world will look like with driverless cars on the road. Jalopnik uncovered the first exclusive photos of the crash, sparking an ongoing debate over driverless cars. Are they an automotive menace or a saving grace for deadly accidents and mind-numbing traffic? Why it's important: A respected racer, husband, and father died competing. Many will remember him personally, and his death will be a driving force for new safety measures in open wheel racing. Why it's important: The earthquake, tsunami, and nuclear crisis in Japan dealt a resounding blow to the Japanese nation, and to the export-heavy Japanese auto industry. The rest of the world made gains while giants like Toyota and Honda faltered. It was more than just a car tragedy, though. It was a massive human one.